Company Name: Spectro Finance Ltd.
SpectroCoin.com At A Glance – Who is Spectro Coin? SpectroCoin is a bitcoin broker. You can buy and sell bitcoin to SpectroCoin and from SpectroCoin. In addition to being able to buy and sell BTC, you can obtain a debit card (physical or virtual). This card allows you to withdraw and spend the bitcoins in your account at millions of ATMs and stores (respectively) converting to fiat at the point of sale. Additionally, if you run a store and accept bitcoins for payment, you can make use of SpectroCoin’s merchant services (we’ll discuss these below). SpectroCoin.com aims to be a one-stop shop for everything related to bitcoin. You can buy, sell, exchange, and withdraw and spend bitcoins (via the debit card), and even use the exchange to accept BTC for your business. If your bitcoin-related needs extend beyond the occasional trade, I strongly recommend you take a close look at this exchange. Is SpectroCoin.com A Trustworthy Bitcoin Exchange? 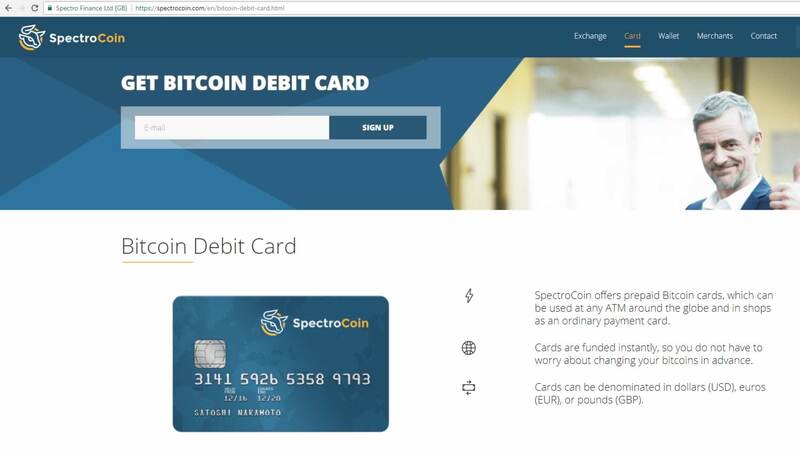 Yes, SpectroCoin appears to be a trustworthy and reputable place to buy bitcoin and get a bitcoin debit card. Especially with a focus on eastern Europe as the primary local deposit option for millions, SpectroCoin has maintained a positive reputation. SpectroCoin was launched in 2013. Since then, complaints have surfaced regarding the exchange’s tendency to close or lock accounts and ban users. A few folks have even called the exchange a scam, claiming it had locked their accounts and confiscated their money without cause. It’s difficult to know how much merit to give these claims. For example, one user on BitcoinTalk.com complained that SpectroCoin locked his account and “stole” $60 from him for no reason. It turned out that he had violated the exchange’s rules regarding having multiple cards. Another user on Reddit called SpectroCoin.com a scam. But when asked to provide proof, the user disappeared. Moreover, several folks responded on that Reddit thread that they’ve had good experiences with the exchange. Product development at SpectroCoin is done in Lithuania, and its services are regulated in that country. Because Lithuania is a member of the European Union, the exchange has implemented anti-money laundering (AML) and data protection procedures that are consistent with EU and international standards. Monies are processed through regulated banks throughout the world. By most accounts, notwithstanding unsubstantiated (and therefore dubious) claims of scamming, SpectroCoin is a legitimate BTC broker. To register an account, you’ll need an email address and password. You’ll also need to set up two-factor authentication via SMS, email, or Google Authenticator. After you create your account, you’ll have the option to verify your profile. You can use many of SpectroCoin’s services without verifying your ID. But ID verification is required if you’d like to leverage the entire list of deposit and withdrawal options. You’ll be asked to provide your first and last name, date of birth, country of residence, and phone number. You’ll also be asked to upload a copy of your passport if you live outside the EU. If you’re an EU resident, you can choose to upload a copy of your national identity card (both sides). Verification usually takes one business day to finalize. If your account is unverified, you’ll be allowed to use OKPay, Perfect Money, and Payeer to deposit funds. You’ll also be able to load a limited amount of bitcoins onto your debit card. Once your account is verified, you’ll be allowed to deposit money with credit cards, or via wire or SEPA. Profile verification also raises your debit card and ATM withdrawal limits. You can fund your account in several ways. For example, you can attach a debit card or credit card to your verified profile, and use it to deposit funds. You can also make deposits via bank wires using U.S. dollars and Euros, both of which can be held in your account simultaneously. Or you can fund your account by transferring DASH and other cryptocurrencies from third-party wallets. Finally, you can use vouchers, such as Amazon gift cards. Fees vary by the deposit option you choose. For example, if you fund your account with a Visa, you’ll pay a 5.5% fee. If you live in Germany and use Giropay, you’ll pay a 2.0% fee. If you transfer funds from Payeer, you’ll pay a whopping 20% fee. Bank transfers via SEPA, as well as transfers from select Lithuanian banks, are processed without fees. Credit card and debit card deposits are usually made available in your account within an hour (often much sooner). Bank wires and transfers from ewallets like Payeer can take up to 24 hours before the funds are available for use. Once the funds are in your account, it’s easy to purchase bitcoins. Simply click the “EXCHANGE” button near the top of your account dashboard. You’ll be asked to specify how many bitcoins you’d like to buy along with your preferred currency (USD, Euro, Gold, or DASH). Does SpectroCoin Provide A Wallet To Store Your Bitcoins? Like most BTC exchanges, SpectroCoin provides a wallet. It’s automatically created for you when you register your account. This wallet allows you to store, send, and receive bitcoins. It’s available for use on mobile devices (iOS, Android, and Windows), which means you can use it regardless of where you happen to be at any given time. Having said that, I recommend using SpectroCoin’s wallet only for temporary storage of your bitcoins. Once you buy bitcoins, don’t let them sit there unattended. Transfer them to another wallet that offers more features and better security. Hardware wallets offer the best security because they generate private keys offline. These wallets are physical devices, and typically cost between $50 and $100. Good options are the Ledger Nano S and the Trezor. If privacy is your main concern, and you’d rather not carry a physical bitcoin wallet, it’s hard to go wrong with Electrum. This is a desktop wallet that allows a lot of configuration flexibility. Mobile and cloud-based wallets are ideal if convenience is your goal. BreadWallet, GreenAddress, and AirBitz are all solid options with good reputations. They’re also free to use. You’re allowed to sell bitcoins in USD, Euros, and gold. Fees are imposed on withdrawals based on the withdrawal option. For example, if you withdraw to Skrill, you’ll pay a 2.5% fee. If you happen to live in Herzegovina and decide to withdraw to Nova Banka, you’ll pay a 5.0% fee. Withdraw to PerfectMoney, and you’ll pay a 7.0% fee. But withdraw to Payeer, and you won’t have to pay a withdrawal fee. If you use a debit card to withdraw cash or pay for goods, you’ll pay a $1 (or €1.00 or £1.00) monthly service charge. In addition, the bank or merchant may charge an additional load up to 1.99%. Note there may also be a currency exchange fee if you’re withdrawing or paying with currencies other than USD, EUR, or GBP. SpectroCoin is supported in nearly 250 geographies, territories, and jurisdictions, from Afghanistan to Zimbabwe. That gives you a lot more flexibility than you’d enjoy at Coinbase, where support outside the U.S. and EU is spotty. Whether you live in U.S., Canada, Somalia, or Kyrgyzstan, you’ll be able to use SpectroCoin.com to buy, sell, or trade bitcoins. And with a debit card (not available in the USA), you’ll be able to quickly convert your bitcoins to cash at ATMs, or spend them at bitcoin-friendly stores. Is SpectroCoin’s User Interface Simple To Use? SpectroCoin employs security measures consistent with those used by other bitcoin exchanges. Two-factor authentication via SMS, email, or Google Authenticator is used to help protect accounts. Customers are also encouraged to set up a security question/answer for further protection. In addition, the CEO of SpectroCoin has claimed that 95% of clients’ bitcoins are held in cold storage. This could mean a variety of things, including that the bitcoins are stored on a hardware drive (e.g. the Trezor), on a USB drive kept in a safe deposit box, or in paper wallet. The bottom line is that they’re stored offline. The first four options are your best bets. They’re designed for support purposes. Reaching out via social media can be hit and miss, since SpectroCoin’s Facebook, Twitter, and Google+ accounts aren’t set up to provide support. And writing a snail mail letter isn’t really a viable option at all. The majority of major exchanges allow you to sell your bitcoins and transfer the cash to a third-party wallet or your bank account. From there, you can withdraw the cash as you desire. The debit card from SpectroCoin streamlines this process. You can use the card to withdraw cash directly from millions of ATMs around the world. You can also use it to buy goods and services from millions of merchants. There are fewer hoops to jump through. SpectroCoin also offers tools for merchants who would like to accept bitcoins for payments of goods and services. A payment platform can be set up for business owners who run online businesses (e.g. an ecommerce store selling shoes) or a traditional storefront. Merchants can accept payment in bitcoins and store them in their SpectroCoin accounts. The SpectroCoin merchant solutions makes use of an API and various plugins that integrate a number of third-party platforms to make funds collection easy. There are only two types of accounts at SpectroCoin: verified and unverified. As noted earlier, you can do a lot with an unverified account. You can deposit funds, buy and sell bitcoins, and fund a debit card that can be used at more than 30 million ATMs and 20 million stores around the world. Having said that, leaving your account unverified imposes limits, particularly when it comes to your deposit options and accessible debit card features. To make full use of your options at SpectroCoin, it’s worth taking the extra step to verify your account. As noted above, if you live outside the EU, you’ll need to provide a copy of your passport. EU residents are required to provide a copy of both sides of their national identity cards. All EU countries are offered SEPA (Single Euro Payments Area) withdrawals. There are also a lot eastern european and middle eastern withdrawal options as well. You can see their fee’s and limits here. Can USA buy bitcoin at SpectroCoin? Yes, you can buy, trade and withdraw bitcoin from SpectroCoin. U.S. residents can not get fiat US dollars or the debit card. You can buy, trade and cash out bitcoins but not fiat. Despite its public image problem – complaints receive attention regardless of their merit – I’ve found SpectroCoin to be a legitimate bitcoin exchange. I love that I have the option to use a debit card at millions of ATMs and stores in hundreds of countries. That makes it easy and simple to use the funds, whether I’m at home or traveling. I also like the fact that SpectroCoin includes a variety of support options, including a phone number. Sometimes, it’s easier to resolve matters with a simple phone call than going back and forth via email or chat. Lastly, the numerous deposit and withdrawal options are a major boon. While some of the fees are higher than I’d expect, the flexibility makes the premium worth paying in certain circumstances. All in all, I recommend that you check out SpectroCoin for yourself, especially if the idea of using a debit card interests you. And if you’re a business owner looking for a way to accept bitcoins for payment, you’ll find that SpectroCoin offers a simple, streamlined solution.